Wireless charger, the mini and extra slim appearance makes it compact and portable.The thickness of the wireless charger is only 7.4mm, the diameter is only 66.4mm. Built-in intelligent chip, high speed charging, over-voltage and over-current protection. When the device is fully charged, the wireless charger will stop working to damage the battery, safe and stable. Qi wireless quick charger with output 5 v / 1A at the maximum, wireless distance up to 6mm. Compatible with all Qi-enabled devices. Made from environmentally friendly materials and delicated craftsmanship to give you smooth touch feeling. The charging area comes with anti-slip silicone pad to keep your device on the perfect. Characteristics 1) Mini & extra slim appearance 2) compatible with all Qi-enabled devices 3) Over-voltage and over-current protection 4) unique design and top-grade materials Specification Input: 5 v / 2A Output: 5 v / 1A (Max) Wireless distance: 6mm Number of coils: some Materials: ABS + PC Size: 66.4 * 7.4mm Instruction 1. Connect Vinsic Wireess Charger with an adpater, the LED will turn on. 2. Put your phone on the charger area of the wireless charger. Your phone will charge it under. 3. When your phone is fully charged, take it away for use. 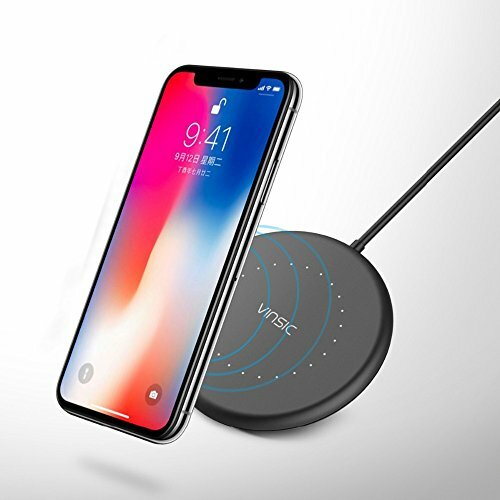 Package included 1 * VINSIC Qi Wireless Charger 1 * User manual 1 * 18 months warranty card Item Size: 66.4 * 7.4mm Item Weight: 47g Package Size: 106 * 105 * 27mm Package Weight: 91g Notes 1. the product does not take place in the wet / high temperature. 2. Keep the product away from children. 3. Heavy drop, falling will damage the product. 4. Please place your phone in the correct charging area of the charger. 5. use your phone while it is being charged.